Electric gates (with a fob provided) open onto a stylish printed concrete driveway with space for 2 to 3 vehicles, even to the front of the property at driveway level the gardens are a landscaped joy to behold. The lower floor accommodation and the pool and terraces are at this level. Seventeen steps lead to the middle floor, there is a front door which opens into a hallway with the kitchen to left, dining room to the right and the spacious lounge straight ahead. The designer kitchen is thoughtfully arranged with all expected appliances and comfortable seating for breakfast, it offers great views over the pool area and a convenient door onto the outdoor dining terrace. The interior dining room is elegantly furnished and features a glass table and very comfortable leather seating for up to six guests. The chic & spacious lounge is also beautifully furnished with leather chaise sofa and large LED television with DVD player and access to UK content through the included Amazon firestick. Two sets of double patio doors from the lounge lead out onto the fabulous shaded dining terrace which features a superb designer sunbed, a very comfortable rattan dining set to seat 6 guests and a modern gas chrome barbecue suitable for cooking for a large group. This terraces is shaded and often enjoys a great breeze in summer, it also offers spectacular panoramic views across the valley. On this middle floor you will also find a very well presented family bathroom and a bright and spacious bedroom with double bed and its own fabulous en-suite bathroom. It offers air conditioning, built in wardrobes and plenty of shelf storage as well as lovely views onto the rear garden. Stairs from this middle floor to the side of the lounge area lead up to the upper floor and the master suite with its own en-suite bathroom and private roof terrace. Beautifully decorated with superb fitted wardrobes and air conditioning. This suite is very private, very chic and really is the pinnacle of a stunning villa. The roof terrace provides bar style seating for two, a gazebo with retractable shade, rattan sofas and a roof top Jacuzzi! Even more stunning panoramic views can be enjoyed from this master suite terrace. Worth a particular mention at this point is the abundance of tuscan stone in use throughout the villa which lends a touch of authenticity to an otherwise modern villa. The grand staircase leads back down to the middle floor from the master suite and then if you continue downwards leads on to the lower level. The lower level has a second very convenient lounge at this level that features cinema style seating and a second smaller kitchen which is ideal for storing drinks and snacks (with its large American style fridge) as it is adjacent to the pool and terraces. This lounge also features a huge curved wall mounted television and DVD player as well as air conditioning, this lounge has a doorway offering direct access onto the pool terrace. On this lower level are also three further bedrooms. The first of the bedrooms offers a double bed, built in wardrobes, air conditioning and en-suite bathroom. The second bedroom offers twin single beds (no air conditioning in this room, a large fan provided and it benefits from the air con in the adjacent living area), the third bedroom on this floor has bunk beds and is also air conditioned. It is worth noting that the guests staying in the bunk room and second bedroom have use of the large family bathroom on the middle floor. Outside is a fabulous shaded seating area, beautifully furnished with comfortable sofas leading directly onto the pool and terraces and a fantastic outlook onto the landscaped gardens. The attractive and larger than average 10m x 5m private pool offers pool heating, pool ladder to the deep end and a feature slide that is water supplied. Surrounding the pool are four very comfortable rattan sunbeds, further seating to the side of the pool and to the side and rear of the property a lawned area with further mature shrubs and plants. 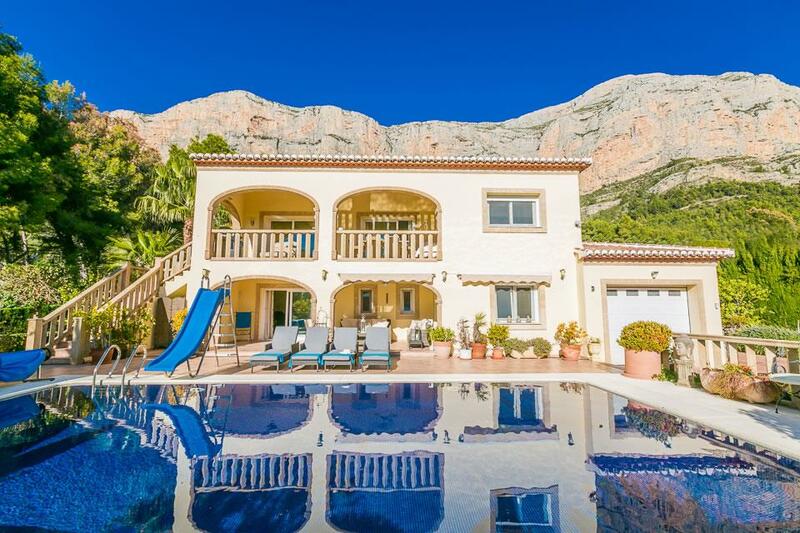 It goes without saying that this villa comes with our highest recommendation. Due to the quality of furnishings and fittings at this villa an extra refundable deposit of £400 is required against accidental damage. Subject to a villa check this deposit will be refunded within seven days of the end of your holiday.